What are the steps in purchasing custom furniture? What are the shipping services and rates? When will my furniture be delivered? How will my furniture be finished? What if I need my custom made RJ Fine Woodworking furniture repaired? Where can I see your furniture in a showroom? First I need information from you on you furniture ideas. You can contact me via the website quote form or call me at 1-901-452-9011. You can reach me Monday through Friday 8 a.m. to 5 p.m. (Central time). After receiving your information I will complete a quote based on this information. This quote will be in the form of a range such as $3,500.00 to 4,200.00. I require a 50% deposit less the 10% design fee after drawings have been approved and a firm quote is agreed on. Materials are now ordered and your furniture is put into the production schedule. We have a relationship with a specialty freight shipper that specializes in "white glove" delivering, unpacking, assembling (if necessary) and positioning your custom made furniture in any room you designate. All packing materials will then be removed by the furniture company. With White Glove Delivery you eliminate the set up and assembly of your custom made furniture, plus no bulky packaging to deal with! White glove delivery pricing varies by location and generally ranges from $300-$400 per custom furniture item depending on your location (there are some savings for multiple piece shipments). Rural areas are subject to an additional charge. Local Delivery. If you are local to the Memphis area, we can arrange for local delivery and set up. In this case we personally deliver and set your custom furniture. Local delivery usually this costs $75 - $150 depending on your location (in some instances it can be more for our extended delivery area). We occasionally can personally deliver as far as Little Rock and Nashville, depending on our work load and scheduling. Local Pickup. If you would like to pick up your custom made furniture, you can visit our studio at 3007 Summer Avenue Memphis, TN. I am typically booked up out 12 to 16 weeks plus the design and build time of your piece. Delivery takes an additional 5to 15 days depending on the complexity of the piece. When we finalize you contract, I will give you an estimated completion date. When your order is nearing completion, I will contact you to schedule a date and time for delivery. If you are not completely satisfied with any your custom furniture or cabinet I will refund or replace it within 30 days of purchase. Beyond that, should my furniture or cabinet fail at any time during the lifetime of the original owner because of workmanship or material, I will either repair or replace it. What if I need my custom furniture repaired? If you would like me to repair furniture that I have built and has been accidentally damaged, please call me at 1-901-452-9011 on weekdays from 8 a.m. - 5 p.m. (Central time). 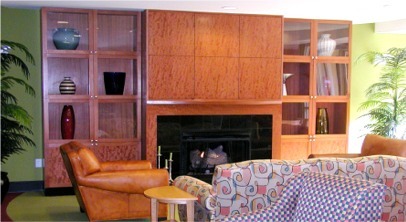 I use different finishes based on the use of the furniture or cabinet. Dining tables require a hard catalyzed varnish finish but a dresser or a chest may require a hand rub oil finish. These are decisions that I discuss with my clients. I do not have a showroom since each project is custom made for each individual client. I do invited future clients to call and make an appointment to visit my wood shop and office located at 3007 Summer Avenue, Memphis, TN Click here for maps.